You’re just about to close up shop when a signer comes in requesting a simple notarization. She speaks to you in perfect English with a lovely French accent, while you gather your journal and seal from its secured place beneath the counter. As you begin the notarization process, you look closely at the documents requiring notarization and realize they are entirely in French. Sacre bleu! 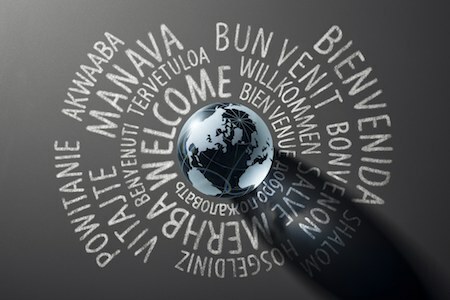 Do you go through with the notarization of foreign-language documents? To participate in this week’s “What Would You Do?” scenario, share your answer in the comments section below. We may mention your response in next week’s Bulletin, when we offer the best possible answer(s) to this notarial challenge. I would notarize the document as long as the notary wording is in English and I and the signer can communicate. I would never notarize a document written in a language I couldn't understand. I would recommend the signer get a French speaking notary. If I cannot determine what kind/type of certificate is being used--end of story. I would refer them to an attorney. AS LONG AS WE CAN COMMUNICATE WITH THE PERSON SIGNING THE DOCUMENT YES WE CAN NOTARIZE THE PERSONS SIGNATURE. In California the notarial document and the signing page have to be in English. However, it won't be easy to detect fraud so it's probably best to not perform the notarization. Also the notarization might not be accepted in the other country. Ask the signer what type of notarization they need and attach a loose certificate. We are not required to understand the document, only scan for completeness and verify signers identity. I would have to refuse to notarize the document since I don't read French and therefore don't know what it says. This goes back to the question of notarizing documents from other countries. Decline the notarization and have them go to their embassy or consulate. I believe that we are still able to notarize a document in a foreign language since we don't have to know what it says but only make sure that its complete without any blank spaces and then we attach our acknowledgement form in English. I believe the first thing I would do is go to the computer and put in the document title in a translation site. Once I have verified that it corresponds to the types of documents that we are allowed to Notarize, I would either Notarize her signature alone or decline based on the State Secretary's parameters of allowable documents. There are also organizations that you can scan an image over to them and they can translate the document for you as well. That being said, as long as your client is amenable to that. I would decline notarizing this document. I cannot notarize a document I don't understand and cannot read for myself. Of course I would go through with the notarization. As long as the signer can positively identify herself, and we are able to communicate in English, the language of what she is signing is not my concern. Yes! You can go through the notarization of foreign-language documents. With this type of request, I ask the signer if there is a venue, today's date or earlier (but not a future date), statement, ensure there are no blanks, and ask the signer which type of certificate they would like to use -- jurat or acknowledgment. I make sure to add in my journal add'l information that the document was in a different language. If you do not understand the language it is written in then you do not know what you are notarizing. I would help or suggest they find a notary who can help them. Either find a third party translator that can translate the document to English or refuse the notarization. I would notarize the document, since my duty is not to verify the contents of the document, but to verify the identity of the person signing the document. I may do it, but will also used my stamp stating verify 'signature only' or I will just refuse too sign. I'm new, just passed the test and haven't even received my commission yet - from what I learned I'm thinking it's okay to notarize it depending on where it's going to be filed, right? Taking a high school French class in my opinion, is not enough experience to translate official documents. I would decline service and request the documents to be translated to english. My 1st language is English and I have been speaking Spanish for over 10 years I notorize Spanish documents. However, sometimes with embassy documents some wording they use is high end, not everyday words one would use, therefore I enlist a native speaker at my place of business to translate certain words if it is outside my vocabulay. I am fortunate to own my own busineas and work along side my apouse who is a native Spanish speaker. He is someone I trust completely therefore I will notorize a Spanish doc with him translating. For any other language which I have done Arabic an English translation done by a professional translator must be present. I do not think it matters what language the document is in. As a lay person you can not offer legal advice to a signer and all you can do is witness his/her signature. That's your primary function as a notary public. Yes, you can notarize as you don't necessarily need to know what the document is saying. However if there is a language barrier between the two of you then that's another story, at least in CA . My answer would be : I am not bi-lingual. the law does not authorize me to notarize this document. therefore I refuse to notarize. This also applies to the French documents. I am not able to do this closing as I do not understand the language in which it is written. I would refuse to sign the document. I do not know French. Thank you for asking. I had a client present me with a document in Turkish. He was fluent in English. The contents of the document were not important to me, but the content of the notarial certificate was. I told him that I could only notarize a certificate in English, or I could direct him to a notary that was fluent in Turkish. He asked me to perform a specific type of notarization, and I attached an appropriate loose certificate in English and performed the notarization. If he had offered to translate the notarial certificate, I would have declined; that is because notaries are personally liable for the notarizations they perform, and since the client was not an impartial witness, I could would not have been able to verify the translation. You may notarize a document written in a foreign language as long as you can communicate in English with the signer, and they have to sign in English. They also have to tell you whether or not is a jurat or an acknowledgement. I come across this scenario all the time. By Colorado state law, I can notarize the document provided: 1.) I can communicate directly with the signer (in my case English or Russian) and 2.) The notary statement is in a language I understand (also English or Russian) and also in English. I scan the documents for blanks (lines and colons are the same in all languages) and look for the signers name throughout the document. I ask the signer if they know what the document is in regards to. As a security against fraud, I scan the document using Google Translate to see if what they told me is accurate (Title, first paragraph, etc.). So long as they can present ID acceptable by state laws, I proceed with the notarization. I happen to be a Certified French translator and often need to have my translations notarized for the client, usually per request of the administration or organization requesting the notarized translation. The notary cannot certify the translation but can certify my certificate of accurate and professional translation, which is a bilingual document (English/French) I prepare for the notary. The notary can notarize that certificate, but does not notarize or certify the content of my translation. This applies to any foreign language document. In this case, as a public notary in California, I would request the nice French person to kindly write a statement in which he/she states the nature of the attached document in French. I will notarize her signature on the statement but will advise that person that this might not be what the organization is requesting and that she might want to check with the organization whether they need the document translated by a certified or professional translator. As a notary, you are only verifying the signer's identity and not the contents of the documents. As long as there are not blanks in the document and the notary certificate is in English, then I would notarize. It is possible that rules vary from state to state. In CA, we can perform the notarization. Since I can communicate with the signer in English I'm clear there. I scan the document for completeness and if that checks out move ahead with the identifying my signer. The notarial wording would need to be in English and if it was not and the signer knew what type of notarization they needed I would use a loose certificate and complete the transaction. If the document appeared to be complete, and the signer and I can communicate and proves to me her identity, I would complete an Acknowledgment (in English) and attach it to the French document. I would sign the documents, how do you know for sure what you are notarizing. This doesn't make any sense, even though your and the person can communicate well, what is written in the documents can be fake, now you just motorize something that you have no clue what is written in the document. I notarize a person's SIGNING a document, not the documents contents -- as we have been told/taught: we are not attorneys and cannot decide what a document should contain. I ask the signer to swear that s/he is aware/cognizant of the document's content and that signing the document does make it an officially legal document. As long as presented IDs appear to be the real deal and the person seems to be "happy" to be signing [I have yet to have someone annoyed! ], I don't have to know the complete contents of the document --not my job! You don't have to know what's in the document. As long as the person sign the document in front of you. according to the Ohio Notary guidelines, yes you can notarize this document as long as the qualifications are met such as proper I.D. etc. The document can be in a foreign language that you do not speak/read. If I couldn't determine what type of document it was, I would refer them to French Consulate for service. As a California Notary, I would notarize the document as long as the document signature is in English and the notarial wording is in English and is in compliance with the required wording for the state of California. Appropriate ID would also be required. You are not required to be able to read the document. You are notarizing the signature and not the document or the signer's capacity. Colorado Notary Law allows a Notary to notarized a document in a foreign language provided the Notorial Certificate is in English. As a Notary, we are not verifying the documents content, we are confirming the signature of the signer. I would do additional due diligence by asking what the document is in regard to for my notary book and confirm this with google translator, but solely because my commissioning employer requires this. There is nothing in the California Notary manual that says that I have to understand the document that I notarize. So long as the certificate is in English, or the signer can communicate with me in a language I understand, I would notarize the document. If the certificate is not in English or it isn't present, I would ask the signer what type of notarization he/she requires, Acknowledgment or Jurat, and proceed with the notarization. There must be a direct communication between the Notary Public and the signer. I would notarize the document as long as the signer could properly communicate it's meaning (to make certain that I'm not certifying anything), the notarial wording was in English, the ID of the signer was decipherable to me, and the venue was in English. I would also make certain that the details regarding the language barrier were properly noted in my journal. I would first verify that the document is complete, no blank spaces, and proceed with the notarization. We are notarizing the signature and not the contents of the document. As long as i can properly id the signer. For those saying "we are just notarizing the signature," what if it is a document that actually requires an apostille, or requires notarization by a civil law notary and not a notary public.... but you don't realize it because you don't know what the document is? In that case, you just performed an invalid notarization! Read our new notary acknowledgment language and it will tell you. First of all you need to be able to communicate with the person asking for the notary. They have to tell you what type of Acknowledgement they need (Jurat or Acknowledgement). If they get passed this you are notarizing that they are the person signing and must prove that with the proper identification. This is for a notary in the state of California. I'll notarize the document, because I'm notarizing the signature, not what in the text of the document. I don't care what language it's. The signer is responsible for the text. In California we need to be careful specially if you don't speak Spanish or other language. The document can said that the notary testify or have another wording that can compromise the Notary specially if the document is done in another country where is a lawyer who can prepare and notarize the document. Is not our business to know the context of the document but as a Notary we need to know what we sign, right?